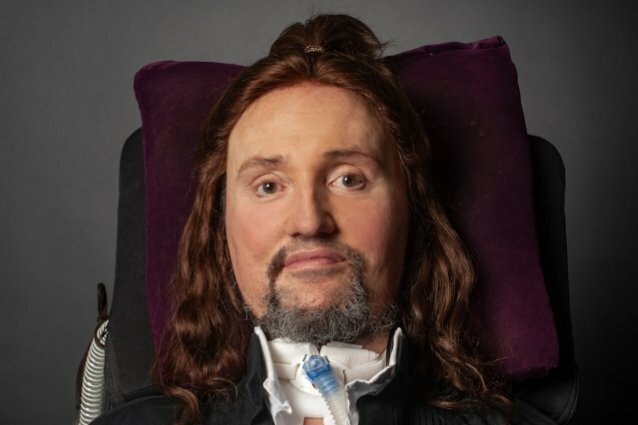 Jason Becker, the guitarist/composer who has had amyotrophic lateral sclerosis (ALS, a.k.a. Lou Gehrig's Disease) for 30 years, will undergo an operation to drain the abscess in his lung on March 21. According to his mother, Patricia Becker, this "should be an outpatient procedure, if all goes well. He is off the antibiotics for now and some of the side effects have ceased, but there are still bouts of shortness of breath and rapid heartbeats, which is quite scary and causes anxiety and stress, which means no computer time and some adjustments in food/water intake and things like that," she said. "Kind of touch and go, but we are all expecting a good outcome." She added: "As Jason says, 'Man, breathing is a good thing.' We are all in survival mode and working hard to come back to 'normal' mode. And fun." Becker's story is one of brilliance, talent, determination, adversity, and, ultimately, triumph. A child prodigy on guitar, Jason rose to prominence as a teenager when he was one half of the technical guitar duo CACOPHONY, with his great friend Marty Friedman. In 1989, at only 19 years old and after wowing audiences all over the world, the young virtuoso became the guitarist for David Lee Roth, following in the huge footsteps of Eddie Van Halen and Steve Vai. He wrote and recorded on Roth's third solo album, "A Little Ain't Enough", and was poised for superstardom when a nagging pain in his leg was diagnosed as Motor Neurone Disease (MND), also known as Amyotrophic Lateral Sclerosis (ALS), or Lou Gehrig's Disease, the same condition Stephen Hawking lived with for over five decades. It is a fatal condition with a life expectancy of maybe five years. Maybe. That was 30 years ago. He lost the ability to play guitar, walk, talk, and breathe on his own. But never lost his will to live or his desire to create music. Communicating through a series of eye movements with a system developed by his father, Jason spells out words as well as musical notes and chords. He imparts his musical vision to his team who then can input the notes into a computer, edit the parts to his exacting standards, and then generate charts for session musicians. His inspiring music and life story have been the subject of countless news articles, magazine cover stories, and an award-winning documentary, "Jason Becker: Not Dead Yet". Becker's latest album, "Triumphant Hearts", was released last December via Music Theories Recordings/Mascot Label Group. The disc features guest appearances by a who's who of six-string gods, including Joe Satriani, Steve Vai, Neal Schon, Steve Morse, Paul Gilbert and Joe Bonamassa.